Place chicken between 2 sheets of heavy-duty plastic wrap; flatten to 1/4-inch thickness using a meat mallet or rolling pin. Brush buttermilk evenly over chicken. Combine walnuts, breadcrumbs, and salt in a shallow dish; dredge chicken in mixture. Pour oil into a large skillet; place over medium-high heat until hot. Add chicken, and cook 3 minutes on each side or until golden. Remove from heat; cool slightly. Cut chicken crosswise into thin slices. 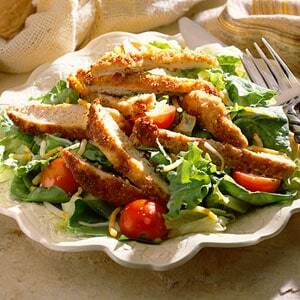 Combine salad greens and spinach, and arrange on each of 4 individual plates. Sprinkle with cheese, and top with tomato halves and chicken. Serve with Buttermilk-Honey Dressing on the side.